DA Form 348 is a United States Army form also known as the "Equipment Operator's Qualification Record (except Aircraft)". 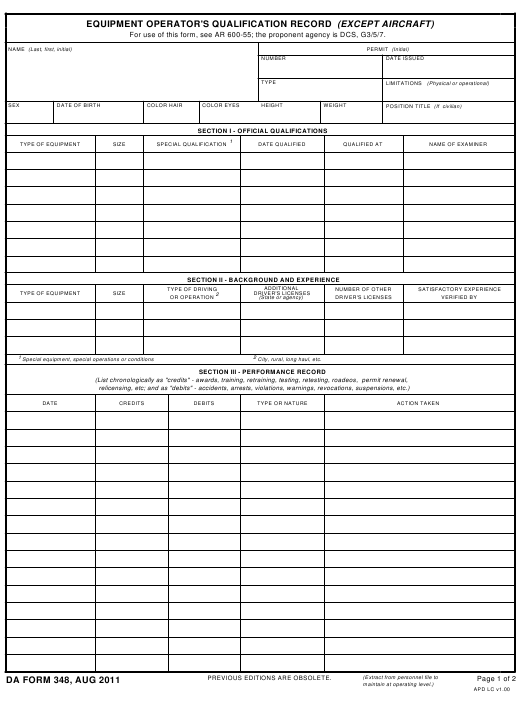 The latest edition of the form was released in August 1, 2011 and is available for digital filing. Download an up-to-date DA Form 348 in PDF-format down below or look it up on the United States Army Forms website. For use of this form, see AR 600-55; the proponent agency is DCS, G3/5/7. City, rural, long haul, etc. 4. CONTROLS - "DRY RUN"
SHOWN HOW TO OVERCOME OR ADJUST THEM.